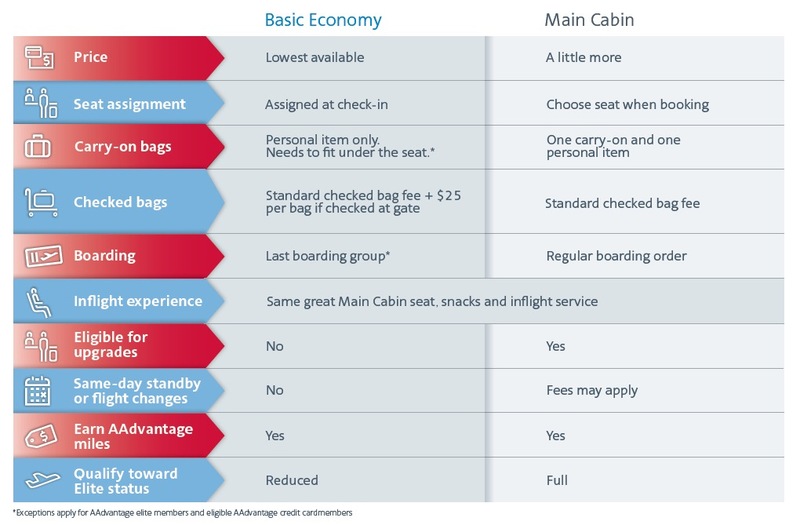 There seems to be a new fare class emerging in air travel lately, essentially dividing the coach cabin between those who can use the overhead bin space, and those who cannot: after United Airlines introduced a cheaper ticket option called a “Basic Economy” fare in November, American Airlines is following suit with — whaddya know? — a “Basic Economy” fare. American says it will begin selling Basic Economy in February in 10 select markets, and will expand to additional markets later this year. Not every American flight will offer a Basic Economy fare. • Seating assignments are made automatically and only when customers check in. If you want to choose where you sit, you can pay to pick your spot 48 hours before the flight. • No upgrades, regardless of regardless of elite status level. • Only one personal carry-on item that fits under your seat is allowed — that means no overhead bin luggage. If you do bring something like a rollerboard bag or larger carry-on, it must be checked at the ticket counter for the applicable checked-baggage charge. That means you’ll incur regular checked baggage charges plus a $25 gate service charge per bag if you bring more than the one under-the-seat item. That being said, elite customers and eligible AAdvantage credit cardmembers will be allowed to bring one personal item, one rollerboard, and maintain their current free checked bag allowance. • Basic Economy travelers will board last. Elite customers and eligible AAdvantage credit cardmembers will continue to receive Priority or preferred boarding. • You can still earn full AAdvantage miles and Elite Qualifying Dollars when purchasing these fares; however, only one-half Elite Qualifying Mile will be earned per mile flown, and one-half Elite Qualifying Segment per segment flown.